Bono’s much-anticipated talk at the recent TED2013 conference is being made available online today in its entirety. In the speech he calls on a new generation of evidence-based activists, or “factivists,” to see that the injustice of extreme poverty is brought to an end. He notes that global extreme poverty has already been cut in half over the past 20 years and, if we remain on the current trajectory, could be virtually eliminated by 2030. Reaching this 'Zero Zone' means that less than 5% of the world’s population will live in extreme poverty. Bono also highlights the incredible progress in the treatment of AIDS, the fight against malaria and the stunning reduction in child mortality - all in the last 10 years. Compared to a decade ago, 7,256 fewer children die every day from preventable, treatable diseases – that’s 2.65 million lives saved every year. “Have you read anything, anywhere in the last week that is remotely as important as that number?” he challenges. Bono warns the progress we have made is in jeopardy – getting to the ‘Zero Zone’ is not inevitable and gains could be reversed. He exhorts the audience to fight corruption, inequality, apathy and inertia in the pursuit of empowering the world’s poorest people. 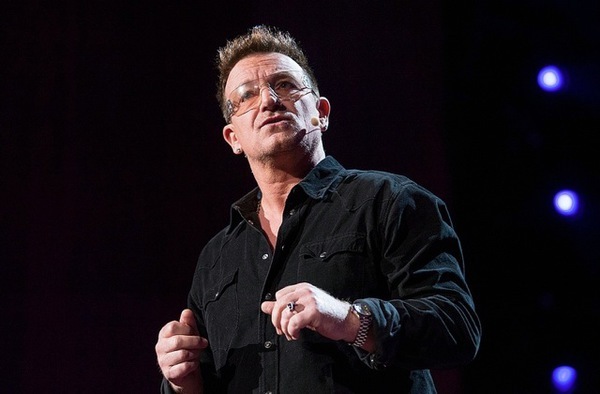 In the talk, Bono challenges viewers to become “factivists” who share the facts of progress and help campaign for more progress – by joining groups like ONE. He also urges governments to continue to fund programs successfully combating extreme poverty and disease like the Global Fund to Fight AIDS, TB and Malaria. Watch the Bono TED talk and get the transcript. It's good to hear some very positive things like that! The fight against extreme poverty will go on- and thats great because it saves lives. Keep on keeping on Bono , thank you for all your hard work. Hope someday the Norwegian Nobel Committee will recognize the extreme effort you make in ending poverty. Bono's TED Talk uppercut delivery is so Fight of the Century Mohammed Ali.... Both Prize Fighters in the World Arena.... Happy Saint Patricks Day.... Salute : ). It is very inspiring and I shall carry this idea of bringing the positive data to the people in order to avoid inertia everywhere all the time! And walk on with U2 for a better world. 1. Clean drink Water for everyone. 2.Heat. 3.Protection 4.Communication (One U2 mobile fair phone) with U2 songs. 5.Health Care for everyOne 6. Clothing 7. Love and light my way, Detlev Lassche. Miss you Sugar. I really hope that as the title says, extreme poverty one day comes to an end! bono, you're always number one on the theme of poverty! and here I wish you, as always, GOOD LUCK! Marco from Italy!